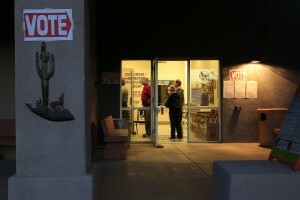 PHOENIX — Hours-long waits for some Arizona residents for presidential primary voting have led to accusations of voter suppression from Democrats and civil rights proponents who cite a decision by elections officials to slash the number of polling places this year. The Phoenix Democrat said Arizona has a long history of voter suppression, including a new law that blocks voter-outreach groups from collecting and dropping off early ballots. Barton said Tuesday’s fiasco largely stemmed from a 2013 U.S. Supreme Court ruling that struck down a key provision of that law.